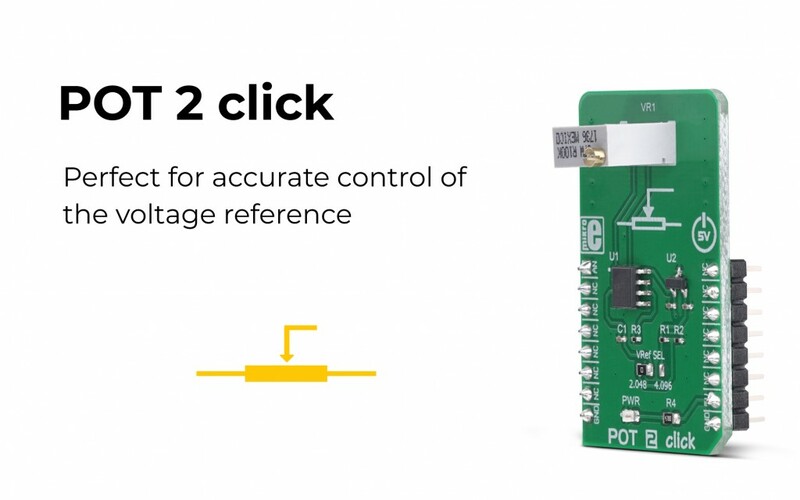 The POT 2 click is a Click board™ with the accurate selectable reference voltage output. By utilizing a multi-turn precision potentiometer, this Click board™ can provide very accurate voltage output on the AN pin of the mikroBUS™. POT 2 click is also equipped with the SMD jumper, which allows the maximum reference voltage to be selected between two typically used values: 2.048V or 4.096V. Using a rail-to-rail buffering operational amplifier which provides constant input and output impedance, this Click board™ is an ideal solution when accurately controlled voltage reference is required. Having the ability to adjust the voltage on the AN pin very accurately, this Click board™ can be used for development of applications that require voltage reference other than what is commonly available as an output from a dedicated IC. This includes HMI applications where the potentiometer can be used to provide fine control the movement of a step motor, or intensity of a LED segment, backlight amount of a TFT screen, and similar applications that require fine control of the voltage reference. For more information about the POT 2 click, please visit our website.